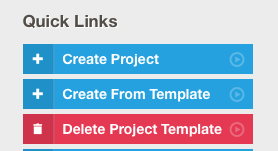 Project Templates let you to store a copy of a project and create new projects based on that copy. If you find yourself repeating the same tasks for different projects, Project Templates are a great way to save yourself some effort. First, you will need to create a sample project with the tasks, sub-tasks and milestones you want to store. 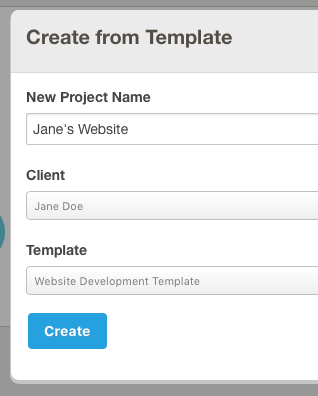 If you already have a project you want to use as a template, click to view it. On the right-hand sidebar, click Save As Template. The template will be created using the current project's name, tasks and milestones. If you want to, you can delete the original project afterward. In the Projects page, click Create From Template, and fill out the form. Specify the new project's name, the client you want the project to be for, and which project template to use. That's it! 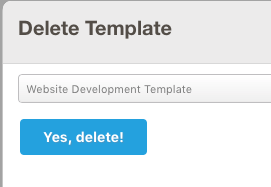 In the Projects page, click Delete Project Template, and select the template you wish to delete. It is safe and won't affect any projects created based on the template.